I’ve noticed that many are claiming October to be the best month ever! 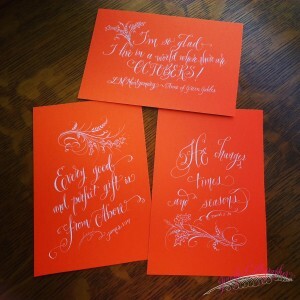 It’s time to pull out a few sweaters, to burn the pumpkin candle, watch some football, change your decor to all things fall, and savor your favorite autumn drink 🙂 The other day I sat down with my white ink and some bright orange paper… lettering in calligraphy some of my favorite fall quotes. My favorite white ink is Dr. Ph Martin’s Bleed Proof White… just dilute the top of your bottle with a bit of water (I use a dropper), gently stir that top layer, and use a brush to ink your nib. Even though it hasn’t quite cooled down here in Texas, and fall colors are yet to arrive, I am glad to live in a world where there are Octobers, as one of my favorite childhood books says. Who doesn’t love Anne of Green Gables, btw?!! I’m grateful that GOD allows change in our lives. Sometimes it’s a welcome change. Other times not, but one thing is sure, HE doesn’t change and can always be trusted! The change of seasons helps us to grow. And lastly, it’s good to recognize our blessings as coming from above – from our Father in heaven. What grace has been given to us. So this October, be thankful! Enjoy the change of season.